A distinct musical identity is something that most musicians aspire to at some point in their growth. Usually this happens on an individual level, but occasionally this drive operates collectively – helping to carve out a scene or a movement based in shared sensibilities. Rarely, however, do individuals take the temperature, as it were, of an entire region’s musical culture, and more rarely still does this kind of diagnosis lead to any kind of corrective measures. Which is exactly why, over the past year, an East African project called Santuri Safari has begun turning heads. Reacting to a perceived lack of innovation and loss of identity within the region’s musical culture, this loose network of musicians, DJs, producers and cultural activists have been making waves in Africa and beyond with a series of events that aim to put Uganda, Kenya and Tanzania back on the international music map. First, some context: most music lovers worldwide would be hard pressed to define a specific genre or standout artist from East Africa. In the recent explosion of interest in African music across the globe, the east of the continent has remained very much in the shadow of the west. New and archival music from Ghana, Nigeria, Mali and Senegal have all received deserved attention, while Ethiopia‘s jazz legacy, Angola’s electrifying kuduro and South Africa’s much-hyped house and kwaito productions continue to resonate around the world. Which is not to say that East Africa has any less to offer. The region has been and remains among the most musically diverse and vibrant on the continent, however it has yet to make an impact globally. What’s more, as globalization and aspirational attitudes towards ‘western’ lifestyles spread, successful artists in East Africa have tended towards more homogeneous, global styles; a mixture of RnB, hip hop, pop and dancehall. In this environment, DJ culture has found a mainstream footing, particularly within hip hop circles; club DJs in Dar es Salaam, Nairobi, or Kampala typically blend the latest local pop hits with the global RnB big hitters, and the airwaves are locked down by stations promoting their own stable of derivative acts. Yet there are pockets of resistance forming. Santuri Safari has been working to connect the dots between like-minded artists and organizations to create a vibrant underground scene - one that prizes experimentation, collaboration and creativity over commerciality. Santuri (the Swahili term for vinyl) was created to support and facilitate artists looking to experiment across genres and between indigenous culture and the global cutting edge. The concept, developed by Kenyan cultural activist Gregg Tendwa and Tanzania-based British DJ David Tinning, utilizes a network of music festivals around the region to bring together unlikely collaborations. Working with festival organizers, the Santuri Safari team build makeshift studios and invite local musicians to drop by and work with a mixture of Kenyan, Ugandan, Tanzanian and international guest producers. Building tracks on the fly, the material is later premiered and road-tested at parties around the festival. Once connected with the Santuri crew at the DoaDoa festival in Jinja, Ugandan musicians such as the multi-talented Joel Sebunjo, Giovanni Kramer Kiyingi and Okello Lawrence went to work with producers and DJs from Nairobi, Dar and Kampala. Through a lucky accident, Esa Williams – a London-based DJ / producer who releases afro-tinged house on labels such as Huntley and Palmers – was participating at the festival and, having heard what was going on, immediately got involved. The sessions in Uganda also gave a platform to some of the regions most talented rappers and the same source material formed the bedrock rhythm pattern for an organic hip-hop jam that could serve as an anthem for the Santuri movement. Tusimame- (Stand up!) features verses in Kiswahili, luga and lusa dialects from the likes of DJ Rachael, Jungle, Uglee MC and more. The material was debuted at a series of parties over the festival weekend, and was met with amazement from local crowds. The material all feeds into the ultimate goal of cutting-edge East African productions fueling entire events in the region and abroad. The collective is joining the dots between various underground parties across East Africa – from the spin-off monthly Santuri Society in Dar to Kampala’s explosive Hatari Voltage events. Nairobi also has a fast-growing scene, the various strands of which were all on display at the recent Rift Valley Festival on the banks of Lake Naivasha. The festival saw Santuri hook up with renowned Kenyan folk artist Makadem, who had recently returned from representing Kenya at the Smithsonian Folk Festival in Washington DC. Recording with Esa Williams and Ambrose in a studio built on a campsite overlooking the lake, the team created ideas within Live, adding layer after layer to create a richly atmospheric house cut, developed out of loops of Nyatiti – a traditional Kenyan string instrument said to be a precursor to the guitar – and live percussion. The track was then performed to a rapt crowd of 400 at the Rift Valley Festival’s Fambula stage, with Esa triggering loops and adding effects via Push, while Makadem provided live vocals and Nyatiti in an extended, hypnotic 20 min jam. 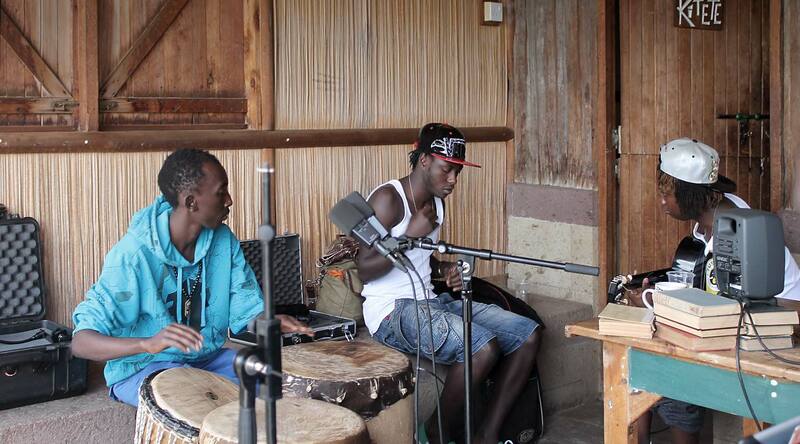 The second track recorded at Rift Valley was a purely acoustic affair made with the young and highly energetic Sarabi band, and was also performed in a similar way – blending loops and rhythms with live instrumentation – an approach not seen before by East African audiences. This willingness to experiment with tradition and technology suggests a new, open attitude to music and clubbing – one where traditional artists can find new audiences, and potential collaborations are aired. As the network develops, Santuri Safari hopes to open up the platform to as many young producers and artists as possible, all encouraged to develop their own sounds and represent their culture and creativity within a supportive scene. Eventually it’s hoped this will lead to the situation envisioned by Santuri’s co-founder Gregg Tendwa, describing the short term goal as “being able to dance to 10 hours of afro-futurism from East Africa”. Next on the horizon is a partnership with Creatives Garage for the 2nd Kenyan edition of Santuri Safari. To be held in Nairobi at Sondeka festival, the event will feature guest production classes by Tony Nwachukwu from CDR London.